From ASD (Autism Spectrum Disorder) to ZS (Zellweger Syndrome), there seems to be an alphabet disorder for almost every behavior, from those caused by serious, rare genetic diseases to more common learning disabilities that hinder children's academic and social progress. Alphabet Kids have disorders that are often concurrent, interconnected or mistaken for one another: for example, the frequent combination of ASD, OCD, SID and ADHD. If a doctor only diagnoses one condition, he or she may have missed others. 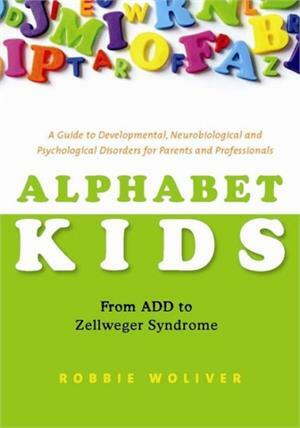 As the rates of these disorders dramatically rise, Alphabet Kids explains it all. Robbie Woliver covers 70 childhood disorders, providing information on causes, cures, treatments and prognoses. Chapters include a comprehensive list of signs and symptoms, and the disorders are illustrated with the often heartbreaking, but always inspirational, true-life stories of a child with the particular disorder. This comprehensive, easy-to-read go-to guide will help parents to sort through all the interconnected childhood developmental, neurobiological and psychological disorders and serve as a roadmap to help start the families' journey for correct diagnoses, effective treatment and better understanding of their Alphabet Kids.